Anglers have been using outriggers on boats in search of more and bigger fish for many decades with major improvements and innovations from the days of the bamboo outriggers, but the pulleys used with the outriggers today are the same basic design used for thousands of years. Anglers trolling with outriggers know the aggravation of the release clip working back to the boat while trolling for trophies. The most common fix for this halyard / line creep has been to squeeze the halyards together above the pulley and tie a rubber band around them or wrap them with some wire so they will not slip, (then after catching a fish or a knock down you still have to untie or unwrap the halyard to bring your clip back to the boat), or to increase the tension on the halyard making you have to pull harder on the halyard to get the release clip in and back out. Its 2 ½ inch size fits comfortably in your hand with easy access to the locking lever for a safe and convenient one handed operation. HAL-LOCK eliminates the need to tie the outrigger halyards together with rubber bands or wire, or using a sliding swivel arrangement. While these methods may temporarily solve the problem, they are time consuming and unsafe. I think most would agree that reaching out over the side of the boat with both hands tying halyards together is not the safest place to be in rough seas. And, there are more important things to do than waste time tying and untying halyards together. The HAL-LOCK outrigger pulley was specially designed for speed and efficiency (and it looks good too). Simply pull the locking lever back and the halyard is pushed into the softer urethane insert locking the halyard in place. That Easy! That Fast!, and because of HAL-LOCK’s unique ability to lock, very little tension is required on the shock cord, allowing you to get your clip up and back down with less effort. Halyard material used with HAL-LOCK should be .080 ± .005 inch mono, 2mm mono or 3/32-1/8 inch braided cord (cord size may vary by type and manufacturer). plain pulley or glass ring with a few exceptions. Use proper size halyard material. Halyard must go between locking lever and pulley. Halyard coming from the top of the HAL-LOCK (top is the side with locking lever) must go to the first eye (the one closest to boat) of the outrigger. 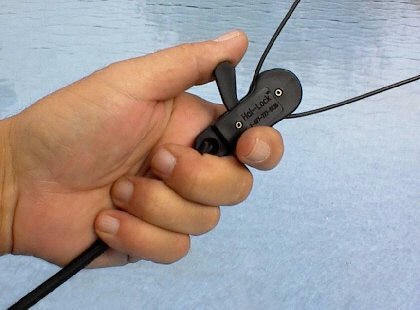 Because HAL-LOCK is able to lock, tension on the shock cord can and should be kept to a minimum.